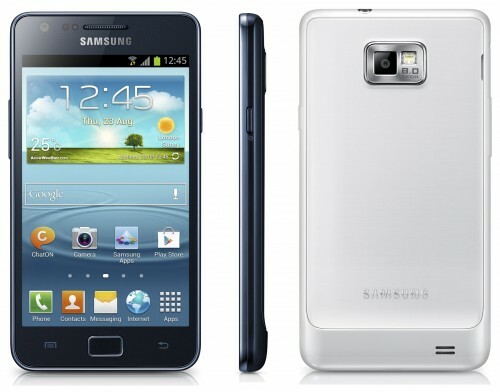 Samsung has officially launched Galaxy S4 LTE A. This new variant has LTE Advanced technology thereby promising higher LTE Speed upto 150Mbps. It’s known by model number E330S. It looks exactly the same as the regular model of gs4. Specwise, it differs in terms of chipset and internal storage (32GB). It has Snapdragon 800 processor and Adreno 330 GPU. The quad-core CPU is clocked at 2.3GHz speed. It has the same battery of 2600mAh though. A more powerful battery would have been useful for handset of this powerhorse, don’t you think? It has already been tested on AnTuTu and Quadrant benchmarks, and indeed SD800 chipset is impressive, my friend. 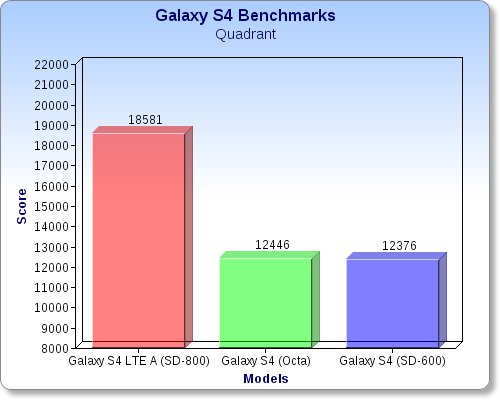 So, lets take a look at the benchmark scores of the new gs4 model. Based on the revealed AnTuTu benchmark test, we’ve score of 29,976 for this new model, whereas S4 Octa scored 26,275 and S4 with Snapdragon 600 scored 24,716. The difference between octa and sd800 model is of about 3500 points here. Now looking at Quadrant benchmark test result, the difference has further widened. S4 Octa and SD 600 model scores relatively close to each other, while SD800 based s4 beats them by scoring massive 18,581 points. 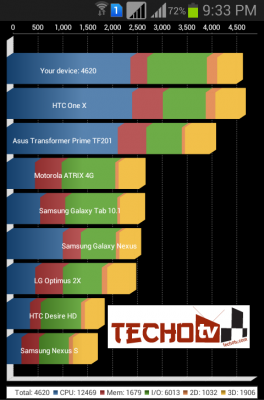 The difference on quadrant benchmark test is huge compared to Antutu benchmark. Let me remind you, these are benchmark tests and results. 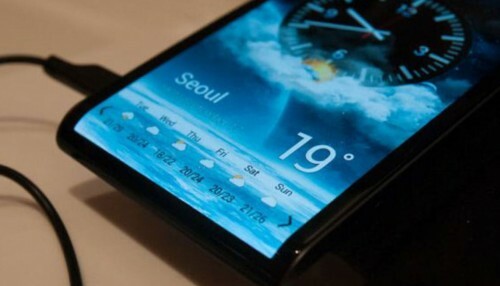 The real world performance may not be that noticeable as S4 Octa is already one of the most powerful smartphone. So, if you ask me if I feel any kind of remorse because I bought s4 octa model, I’d say not. 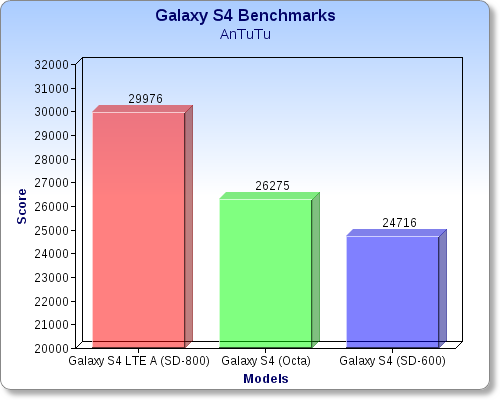 I’m happy with S4 octa scores as well. 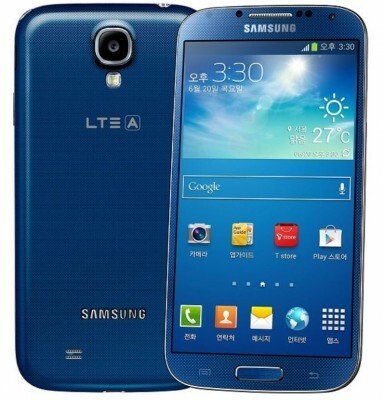 S4 LTE A will start selling soon in South Korea while its release in other important markets is not confirmed yet. Thank you for watching. Don’t forget to subscribe. Do leave us your valuable comments!